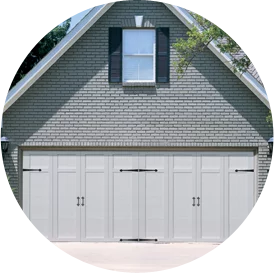 Are you in the market for a garage door for your new home? You have many different decisions to make—such as the material, style, panel design, etc. Most of these are based on your personal preferences and aesthetic tastes. But some factors are based on your needs and lifestyle—such as the size. Contact us to get started on your project, or keep reading to learn more! Some door series may have different sizes available. You should check with your local Overhead Door distributor about the availability of specific sizes or custom width doors. Standard Overhead Door garage door sizes are whole-width increments starting at 8 feet wide and going to 20 feet wide. Some door series have sizes smaller than that. Standard heights are 7 feet and 8 feet tall. Other heights and widths are also available and vary by individual door series. The side-folding security grilles don’t even have a width limit. Looking for garage doors near you? No matter what your needs are, Overhead Door has you covered—we have a wide variety of choices when it comes to garage door size (as well as material, style, panel design, etc.). If you live in the southwestern Ohio area and need to install a new door for a home or building, Overhead Door Co. of Greater Cincinnati can help. We can also help with any garage door repair needs you have. Contact us today to learn more about our services or to schedule a consultation!